Remember the leeks from the broccoli soup recipe? 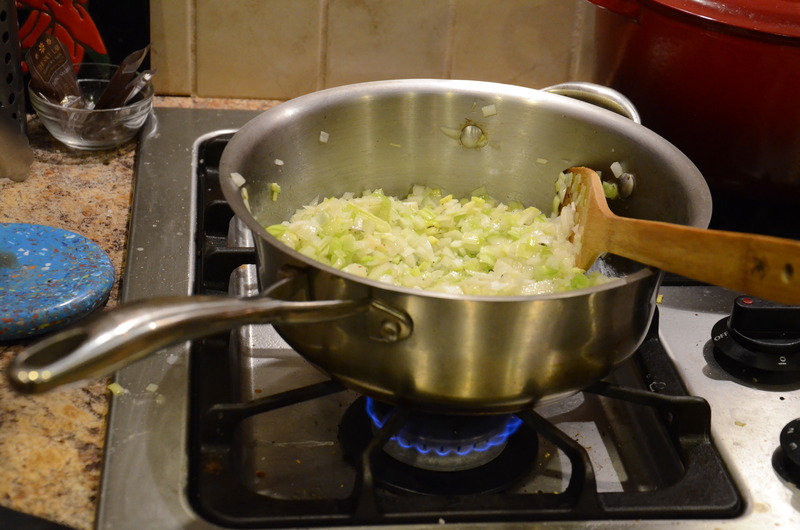 Well, the store doesn’t sell leeks individually — you have to buy several — so I had some left over. I also wanted to use fish in a meal I cooked one of these days. As you may know, one of the those recommended habits for healthy eating is incorporating 2-3 servings of fish per week, to gain the benefits from healthy fats. This meal was going to be shared with my husband for once, and while quite fit in general, Matt’s blood work has shown that he could improve his cholesterol levels. 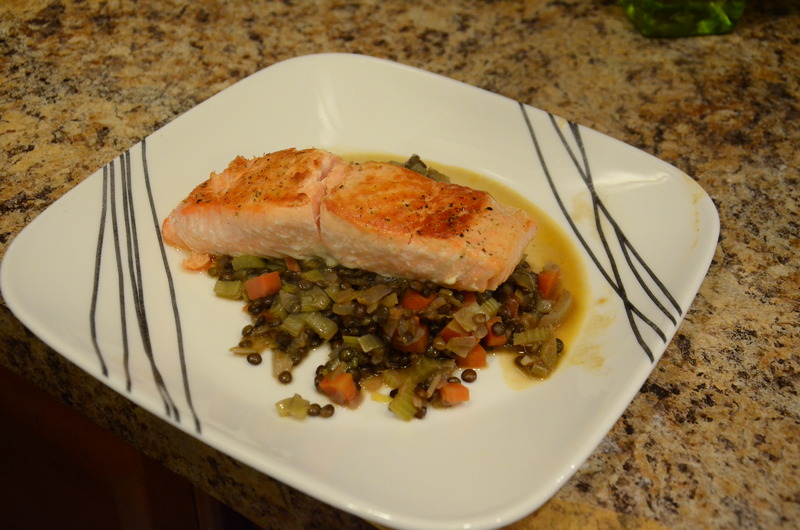 I came across a recipe on the Food Network website by Ina Garden for “Salmon with Lentils.” Subsequently, while searching for a particular recipe among my saved selections and reading through several, I discovered that leeks and salmon and leeks and lentils are common combinations. I am going to try to store this tidbit in my memory for future planning. This recipe also used–surprise surprise–more celery and carrots from my refrigerator stock. 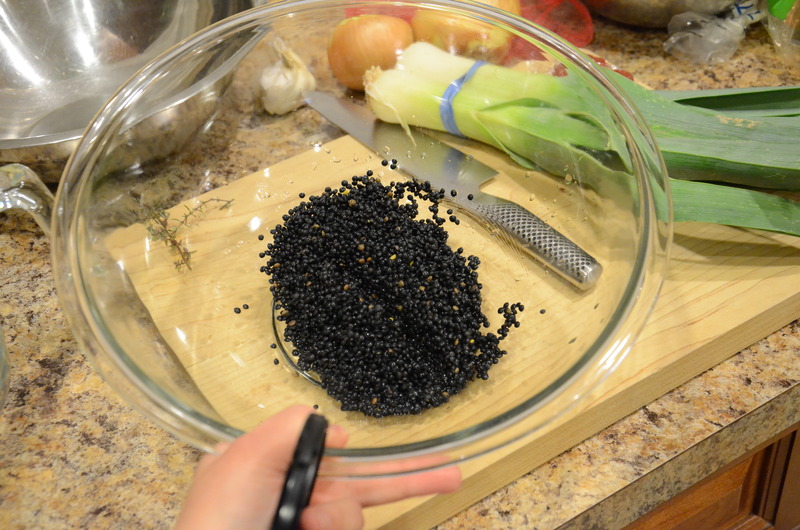 6 ounces lentils (I had this much left of black beluga lentils I bought in a whim with a gift card to Williams Sonoma. These are great lentils though, if you can find them, and they work well in place of green lentils, which could also work here). 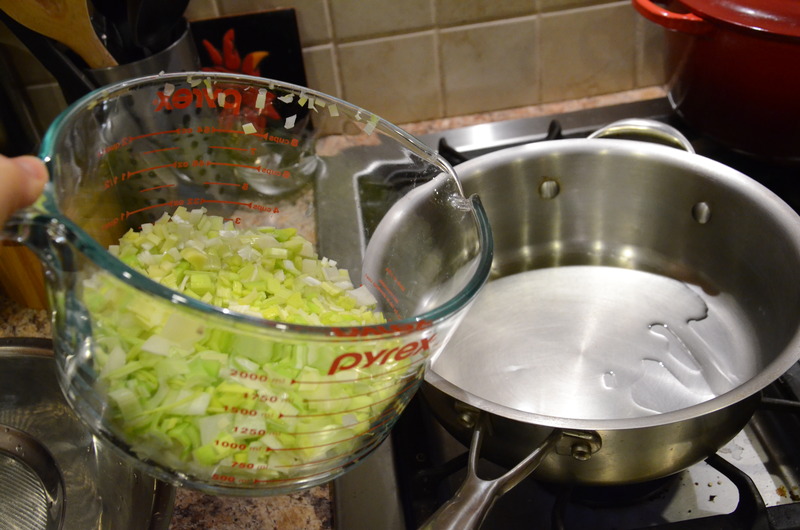 1.5 cups chopped leeks, white and light green parts only (Leeks can acquire a lot of dirt and grime during harvest. To prepare, cut to separate white and light green part from green leaves. Cut once lengthwise. Submerge in a bowl of cold water and slosh layers around. Drain and then arrange pieces together to chop crosswise). Heat oil in a medium-large saute pan. Add the onions, leeks, thyme, salt, and pepper and cook over medium heat for 10 minutes, until the onions are translucent. Add the garlic and cook for 2 more minutes. Add the drained lentils, celery, carrots, chicken stock, and tomato paste. Cover and simmer over low heat for 20 minutes, until the lentils are tender. Add the vinegar and season to taste. While the lentils are simmering, preheat the oven to 450 degrees F.
For the salmon, heat a cast-iron or other oven-proof saute pan over high heat for 4 minutes. 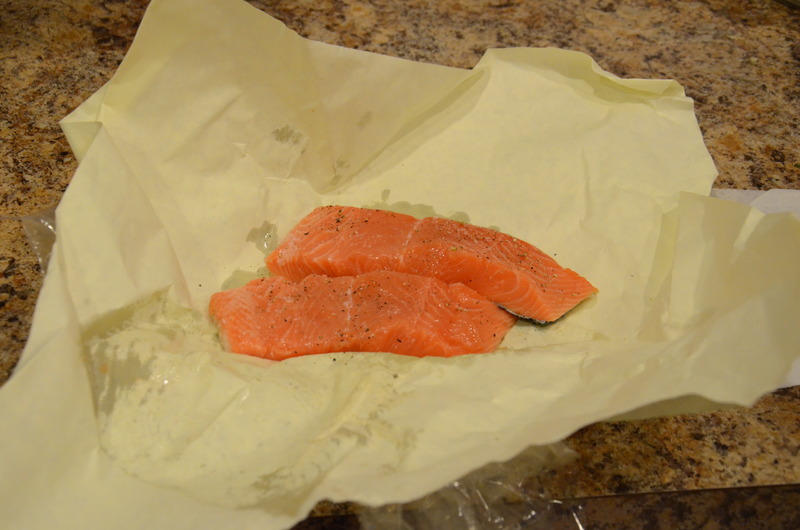 Rub both sides of the salmon fillets with olive oil and season with salt and pepper. When the pan is very hot, place the salmon in the pan and cook over medium heat without moving them for 2 minutes, until very browned. Flip fillets, and move pan into preheated oven. Cook 5-7 minutes, until the salmon is cooked rare and still moist. Scoop lentil-vegetable mixture on plates and place a salmon fillet on top. This entry was posted in Fish, Great leftovers for lunch, Lentils, Recipes and tagged carrots, celery, leeks, lentils, salmon. Bookmark the permalink.